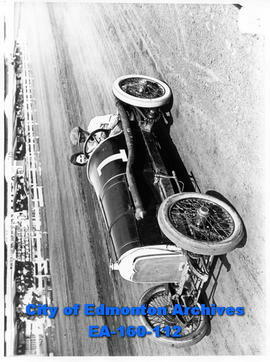 1919 Touring Car - Edmonton Journal. An automobile in front of a log house. These glass negatives were taken from a glass slide collection entitled: Religion. Mr. C.O. Bowen. June 1938. 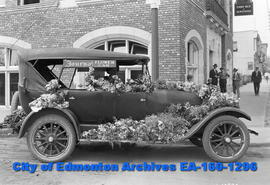 A community posing in front of Charles O. Bowen'sGospel Van, likely in the Peace River Country. These glass negatives were taken from a glass slide collection entitled: Religion. Mr. Bowen, B.C. January 1940.